Cave Creek is a town in Maricopa County, Arizona, United States. The largest city it borders is Phoenix, Arizona. According to the 2010 census, the population of the town was 5,015. 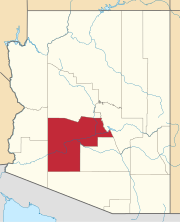 In 2000, the state of Arizona, Maricopa County, and the town of Cave Creek bought Spur Cross Ranch, a 2,154-acre (8.72 km2) tract of Sonoran desert just north of Phoenix, for $21 million. It had unusual cacti, stone formations, and hundreds of pre-history Hohokam Indian tribal artifacts, and is now a Maricopa County park. In the town, the population was spread out with 20.9% under the age of 18, 5.5% from 18 to 24, 24.2% from 25 to 44, 36.1% from 45 to 64, and 13.3% who were 65 years of age or older. The median age was 45 years. For every 100 females, there were 100.1 males. For every 100 females age 18 and over, there were 97.5 males. In June 2009, Cave Creek attracted media attention when a game of chance was used to break a tie in a vote for Town Council. The drawing of playing cards led to the victory of 25-year-old law student Adam Trenk over incumbent Town Council member Thomas McGuire. The Arizona State Constitution allows a game of chance to be used to break ties. "Where the Wild West Lives" was adopted as the town motto by the Cave Creek Town Council during a November 2013 meeting. The portion of Cave Creek west of longitude 111°59'44.21"W is served by Deer Valley Unified School District and the remainder of the town by Cave Creek Unified School District. Cave Creek residents use Phoenix Sky Harbor International Airport or Mesa Gateway Airport to fly on commercial airlines. Deer Valley Airport, the closest airport to Cave Creek, is a very active general aviation airport. ^ Greg Gordon (October 27, 2008). "McCain pushed regulators for land swap, despite pledge". McClatchy Newspapers. ^ Archibold, Randal C. Election at a Draw, Arizona Town Cuts a Deck, The New York Times, June 16, 2009. Accessed 2009-08-25. ^ Carcamo, Cindy. (November 7, 2013). A showdown between Arizona towns over motto. The Los Angeles Times. ^ McLellan, Sarah (October 12, 2016). "Hockey, horses constants for Arizona Coyotes' Shane Doan". azcentral. The Arizona Republic. Retrieved October 13, 2016.